Eric, Chris and I went to the theatre together this week to view the film “Son of God” in order to render opinion on it, take the church youth to see it, etc… and we’ll have more on that in other writings – simply will hint here that it is going to be fairly positive. But while at the theatre and seeing the trailers for upcoming flicks there was one called “God’s Not Dead.” To be released on March 21st, it is the story of a young man who chooses to stand alone against a liberal, atheist college professor. He is challenged to a series of debates in class and other ignominious expressions, to which the student stands his ground successfully. Apparently the plot is based upon an unverifiable, but oft-repeated story of such an encounter by someone, somewhere, in some college. Does this happen? I’ve heard that this sort of challenge often happened regularly in our own little college in our own little town by our local most famous proponent of atheism. One of my boys attending a most liberal university did have to stand alone against professorial abuse on the issue of doubting the scientific veracity of climate change. It got ugly. The courage to stand alone in the face of power or supreme authority – that takes fortitude based upon deep belief and conviction. 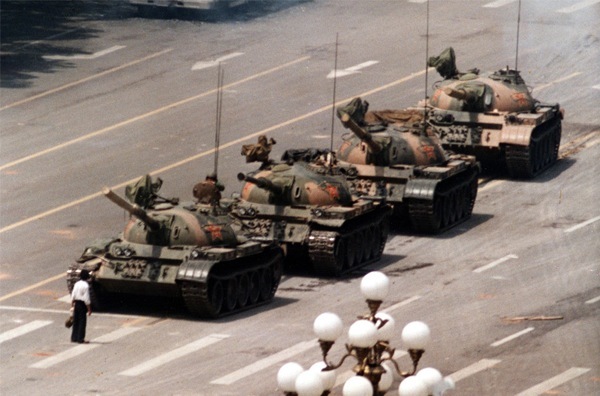 My first mental picture of such is that fellow some years ago in Tiananmen Square who stood alone, face to face against the Communist tank. Sometimes the tank turns around, sometimes the tank takes a different route, but sometimes the tank runs you over. Today we see the story of Shadrach, Meshach and Abednego, who conspicuously on a vast plain surrounded by thousands of people who bowing to the image of Nebuchadnezzar, chose to literally stand out in that throng of people. 3:1 King Nebuchadnezzar made an image of gold, sixty cubits high and six cubits wide, and set it up on the plain of Dura in the province of Babylon. 2 He then summoned the satraps, prefects, governors, advisers, treasurers, judges, magistrates and all the other provincial officials to come to the dedication of the image he had set up. 3 So the satraps, prefects, governors, advisers, treasurers, judges, magistrates and all the other provincial officials assembled for the dedication of the image that King Nebuchadnezzar had set up, and they stood before it. A question may arise, and has been asked over the years – where was Daniel? Bowing somewhere? On a trip out of town? At a level of government not requiring the same allegiance? We don’t know; but we do know of his faith and boldness … since, all of us having read Daniel before know that there is a lion’s den story coming up soon. And who was this fourth person in the fire – identified by Nebuchadnezzar as some sort of divine being? This is a pre-incarnate appearance of Christ – like the visitor to Abraham, the wrestler with Jacob, the voice from the burning bush, and the Captain of the Lord’s Host who appeared to Joshua. I have had a few awkward moments in my life where I’ve had to take a stand – I remember one at age 17 where I walked away from a whole gang of my high school friends at a county fair, when they started picking up girls toward the end of going drinking, etc., etc. that evening. I walked home alone in the dark that evening, and though truly the event held little actual interest or temptation, I remember keenly to this day the feelings of loneliness and isolation of that night. But all to say, I’ve never had to take a stand like these three Hebrews … not yet, that is. Just days ago in his March 4 homily, Pope Francis called persecution a “reality” of the Christian life, challenging the faithful to take up the cross. There are more Christian martyrs in the world now than at any other time in human history. It is just not happening much here in America, even as we uncomfortably sense some shifting winds and tides … and while we note changes in the culture that give rise to an intolerant hatred of the people of the gospel. But remember, this is normal; this is the common experience of the disciples of Christ over the centuries. Could you stand? Would you? The three friends were miraculously saved by the Lord. But in the book of Acts, Stephen was stoned. And though Hebrews 11 speaks of the great faith of many, it also talks about those Christians who were sawn in two. Sometimes the tank turns around, sometimes the tank takes a different route, but sometimes the tank runs you over. And God is in all three situations. Can you stand?